Women in construction face plenty of discrimination – they’re only nine percent of the workforce. But many of them are taking home paychecks that match men’s wages. According to the latest numbers from 2016., construction is a $75 billion industry in Texas. It’s an industry we’ve reported on before on the Standard. Including a big story last year. While our reporter was on the ground in Houston, she came across something pretty rare; a female construction worker. “I just recently became a mother – women – we do it all,” said Cynthia Tercero. On the day we spoke with her, she was the only female in a crew of hundreds of construction workers. But the numbers are growing. As you might imagine, construction work in the United States can be incredibly dangerous for anyone. Take welders for instance. “Walking beams at heights is a very dangerous thing,” says Mary Jo Emerick, who has been welding for 40 years. Welding is especially dangerous when hauling equipment or when catching tools that somebody else tosses at you. Now in her 60s, Emerick began welding in Houston, when the Carter Administration wanted about seven percent of all contractor work to go to women. But the push for more women failed. “I’ve seen some come in, and leave by lunch. None have stayed. I was the only one that stayed,” Emerick says. That may be in part because the construction industry is incredibly hostile towards women. The Occupational Safety and Health Administration, or OSHA, released a one of a kind study in 1999 that found 88 percent of female construction workers reported being sexually harassed. “I had a young man that every time I went to lift something or bent over, he would make obscene gestures,” Emerick says. He’d stand behind Emerick and simulate sexual acts while the rest of the crew cheered him on. Emerick was the supervisor. But she says nothing she did would stop the men – until she decided to sue the company. That was the first of three successful lawsuits throughout her career. That didn’t make her popular but it may have saved her life. At a job site in Austin, Katia Quijano tells me the danger of being sexually assaulted is always there. “The jobs can be pretty dangerous if you don’t take your precautions,” says Quijano, who owns and operates a concrete staining company. When she’s in action, she looks like a hockey player gliding on ice – except she’s on concrete. Her job has to be done once everything else is in place – after all the walls are up, the electrical stuff is done – so the sites are normally vacant when she gets there. “Literally no one is around, because I work Saturdays and Sundays,” Quijano says. Sometimes Quijano hires day laborers to help her. She says the first time she did, she was petrified. So she started a database. Before the men she hires get into her truck, Quijano takes their picture and gets their name and address. She sends that information to her husband, just in case she ever needs to file a police report. But a hostile environment isn’t the only challenge for a female in the construction business. The OSHA report found women also have to deal with some things as simple as ill-fitting equipment. 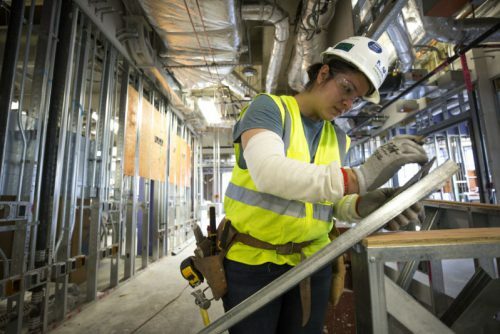 “The tools may be built for a man’s hand and not a woman’s hand and therefore they have to build a special tool that would be made for them and it would come at a higher price than a normal tool may come off the shelf,” says Tamara Crooks of the National Association of Women in Construction. If you search for women’s gloves at a Lowes or Home Depot, you’ll find a wide selection of gardening gloves – not heavy-duty construction ones. And although a hard to hold hammer may just be uncomfortable, Mary Jo Emerick says an ill-fitting harness could be life-threatening. “It’s gotta have to be able to fit your size, and they’re not going down to that 100-pound girl,” Emerick says. Or a pregnant girl, for that matter. Both Emerick and Quijano continued working through their pregnancies. But, despite the big challenges, and what some may consider the minor challenges – like being called names or getting their work sabotaged, or not being able to use the men’s bathroom even though there isn’t a woman’s bathroom – more women are joining the construction ranks. Right now 9.2 percent of all construction workers are women. That’s the highest percentage ever. Crooks with the National Association of Women in Construction says that’s due to a couple of factors. “Because we have a generation of tradespeople that are leaving, so there’s a growing movement towards recruiting people – male or female – to fill trades positions,” she says. People are retiring and fewer folks are entering the field. The current shortage is so bad that construction crews are being poached from job sites. “You know? You see a good crew, you ask them ‘hey, if you come to my job I’ll give you $2 more per worker per hour.’ And, they will literally pick up and leave,” Crooks says. Remember we said that there were pros and cons about women being in construction? And we started with the bad stuff? Well, one good thing is that the demand for workers means ther in many cases women are no longer seen as a nuisance that must be tolerated – they are needed. And classrooms with the next generation of construction workers reflect that. At Austin Community College, students learn the chemistry of metals. Mary Jo Emerick, now retired from welding, is their instructor. This semester, for the first time, she started with two women in class. One of them is 28-year-old James Mescall. She’s currently a mechanic, but is looking for a change. “I feel like in this field I can make more money,” Mescall says. And that is the other pro, if you can call it that. Construction in the U.S. is one of the only fields where women are not grossly underpaid, compared to their male counterparts. On average, women in the U.S. make 80 cents for every dollar men make. In construction, it’s 97 cents for every dollar. Mescall is well aware of all the risks of the industry. But she also loves building things and knows she could soon make a six-figure salary. But a big paycheck is only a guarantee for now. Because it’s likely salaries will only stay competitive while women continue to be a minority. Studies show that when women start to dominate a field, employers begin to slash their wages.